When you have Fructose Malabsorption, it mostly means the end of all the easy ways to have your meals: fast food, boxed dinners, most cereals, etc. And although that may mean you are avoiding things like preservatives and trans fat (mostly…) you also end up sacrificing a lot of time to cooking. So I’m going to start looking for easy meals for FMers to make–15 minutes or fewer! Cook the macaroni according to the directions on the box. Meanwhile, shred chicken into a small bowl using your fingers. 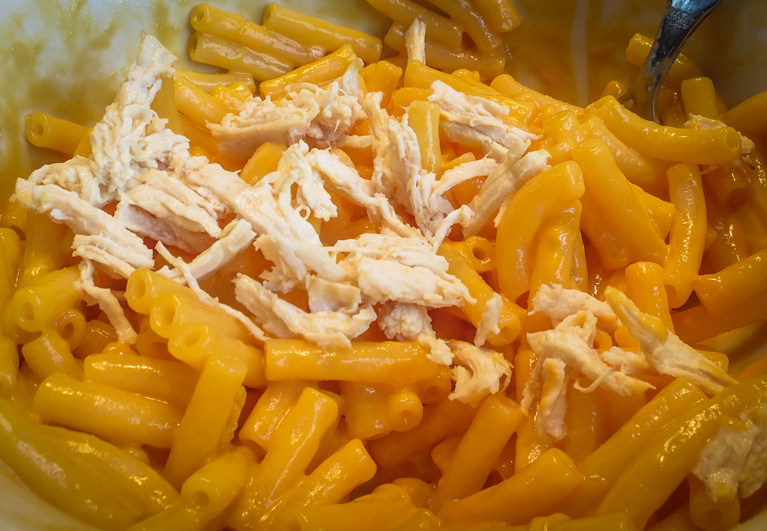 Mix together the powdered cheese (included in box) and milk, add in pasta and chicken and stir. Time: About 8-12 minutes depending on which box of mac and cheese you choose. This entry was posted in Recipes and tagged Annie's Macaroni and Cheese, chicken, elimination diet, fructose malabsorption, macaroni and cheese, pasta by nosugarlessgum. Bookmark the permalink.